We provide a loving home for your dog while you are away. For a day or several weeks, your dog will be part of our household with access to our large fenced yard to romp and play. Lots of cuddling and attention is gratis as well. SSS specializes in small group social daycare and boarding and we strive to provide a safe, sane and fun place for your dog to stay, suitable for short and long stays. Doggy daycare services (limited): Tuesday through Sunday we welcome daycare dogs as long as we have space and there are not too many boarding dogs here. (Boarders have priority). SSS is not looking to take on 5 days per week daycare dogs, but we are happy to include more 1 – 3 days per week dogs and occasional daycare dogs to the pack. This conributes to a well-balanced pack. No doggy daycare on Mondays. Adventures: Each day we take an excursion to a stimulating fun-filled outdoor adventure (generally off-leash if your dog is off-leash worthy). 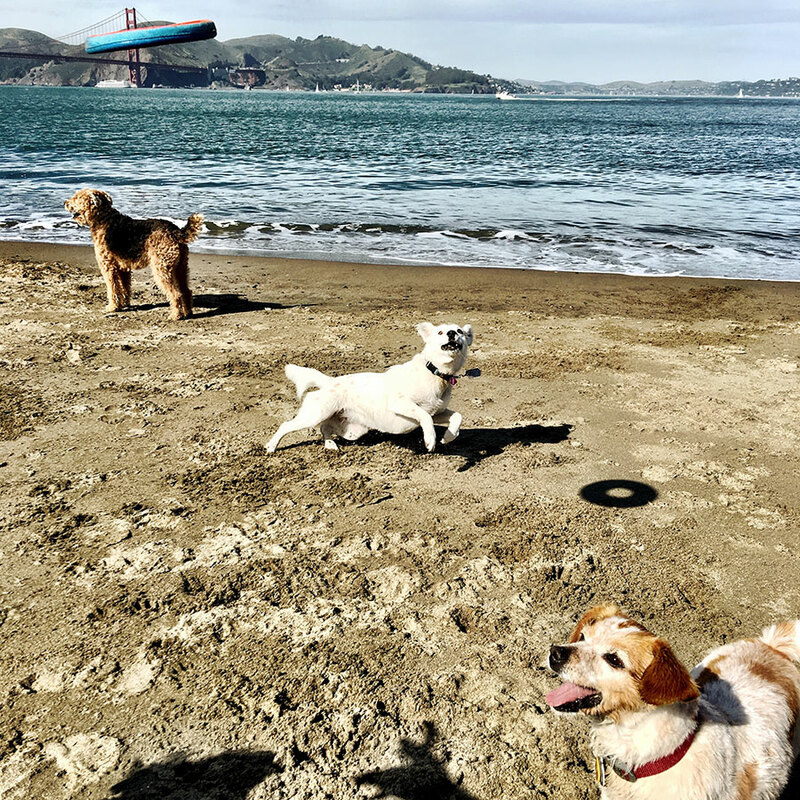 Our great dog friendly parks, beaches and trails in the area, provide a variety of experiences and range of stimulation and fun for the pack. Dog Bath Service: Our standard practice includes a rinse off of dogs after swimming in the Bay or playing in the mud. If you’d like your dog to come home squeeky-clean, we are now happy to offer complete dog baths with good quality dog shampoo and warm water (now that we have a hot water hose in the yard), as well as a basic brushing after their last walk. We are insured and Kendra is Dog-Tec certified and trained in basic dog first aid/CPR. Training (limited). 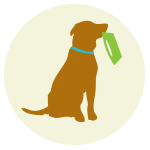 We practice positive reinforcement in general and have years of experience with dogs and a solid understanding of their behavior. We are not however certified dog trainers or behaviorists. Hours of availability: Being a home-based business means someone is here most of the time. That being said, we do have preferred hours you arrive with your dog. Pick-ups are between 4 – 6 pm. Late pick-ups are until 9:30 pm – based on availability. All drop-off and pick-up times need to be scheduled with Kendra. Because Sit Stay Sleep is based in a residential home, we are selective about the dogs we take. That said, I have increased the number of boarding dogs I’ll take to 5, and with my dog Loofah, that makes 6 dogs here on full nights. There may be an additional 2-3 daycare dogs on any given day. Over the past several years, I’ve improved my dog management skills and have gotten better at screening new dogs to assure a safety and stability for the pack as a whole. Age requirements: Puppies must be 6 months old. All dogs under 18 months old must be crate trained. In general, dogs are loose in the house/yard. When I leave the house, on errands, I find it much safer both for the dogs and my house to crate young dogs. Size requirements: Because we offer mixed-size social boarding, I’ve stopped taking new dogs under 15 lb. or over 70 lb. for safety’s sake. Smaller dogs must be relatively comfortable with larger dogs. Behavior: Your dog must have good overall socialization skills. This is our home (not a kennel) and we do our best to keep it that way. If your dog has a destructive side, they will need to be crated when they are left alone. Barking: Barking when someone comes to the door, such as the mailman or a new dog arriving is okay. However dogs that bark at every noise outside, excessive demand barking, and bark just for the “fun of it” may not be the best fit for SSS. Playing: Your dog needs to be well socialized with both dogs and people and not to be overly possessive (growling or snapping at other dogs when high-value items are around). We have “toy bins” both in the yard and house with a variety of toys/bones/rubber balls and it is important that your dog will not become aggressive with these stimuli. I do not have tennis balls in the yard for free play. The tennis balls only come out when we are actively playing fetch at the park. Spaying/neutering & potty training: Dogs over 1 year old must be spayed/neutered. Your dog must be housebroken. Fleas & Ticks: It’s important that your dog be current with a flea treatment. We do our best to manage fleas here but by mid-summer some exposure in our yard and parks is unavoidable. Our house dog, Loofah, is on an oral treatment which works well. If you are using a topical treatment, please apply it at least 24-hours prior to arrival. Fleas have built up a tolerance to many of the topical flea treatments which have been less and less effective, so there is no guarantee your dog will not pick-up a flea or two while with us. However, we do our best to manage unnecessary exposure. Ticks are always an issue when hiking in the hills. We do check dogs after each romp in the hills or playing in tall grass, but ticks happen. We do our best to limit all dogs exposure to these pests while still having a good time.